Eagle Creek luggage and travel accessories are designed to make your life easier when on the road. Furthermore, Eagle Creek products are made to last a lifetime, because travelling is a passion for life. Eagle Creek is made by travelers, for travelers. What Does The Eagle Creek Brand Stand For? Innovation and quality in both materials and craftsmanship has been integral part of the Eagle Creek brand from the beginning but the company was founded in 1975. Eagle Creek has been first with various new travel concepts, e.g. introducing series of products designed to keep valuables safely hidden away while travelling, i.e. incorporating the concept of personal security into their product range. While the Eagle Creek Pack-It system revolutionized the way travelers pack. As we see it, Eagle Creek stands for durable, practical, versatile, lightweight, comfortable, organized, and secure... or everything a traveler needs in a luggage. Eagle Creek mission is to make travelling easier. This is why Eagle Creek not only offers luggage, they offer 4-step travel system. Eagle Creek truly offers everything you need to make your journey easier and more enjoyable. The first step is to pick the right bag for your travel needs. As they say, "a journey of a thousand miles begins with a trusted bag". 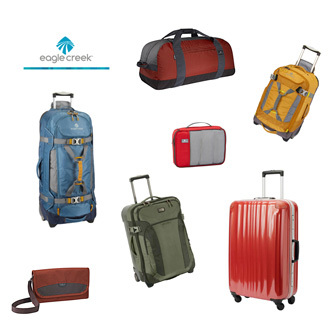 Eagle Creek Luggage And Packs come in wide variety of styles and sizes. From Eagle Creek backpacks to Eagle Creek wheeled duffel bag, whatever you need for your journey, Eagle Creek has it. And the Eagle Creek luggage of your choice will be durable, practical, versatile, lightweight, comfortable, organized and secure. Eagle Creek takes packing seriously and their packing system revolutionized the way travelers pack. Eagle Creek Pack-It System includes series of packing cubes and folders that tackles any organization challenges you may face when packing your bag. Travel organizers help you to stay organized when packing, fit more into your bag, protect your belongings (less wrinkles, moisture and odor control, etc), and help you to stay organized while travelling. Find out more about the benefits of Using Packing Organizers. There are so many things we need or like to bring with us when travelling, i.e. things to make our travel easier and / or more enjoyable. Eagle Creek calls it Travel Necessities and has developed large collection of clever and practical travel accessories, like international converter set, travel towel, luggage security straps, money belt, travel pillow, TSA locks, etc. You need luggage to pack all your belongings while travelling to and from your destination. However, travelling is about enjoying your time at your travel destination. Which means you need a daypack to carry some of your belongings when out and about, like your wallet, camera, book, tablet, sun block, water, etc. 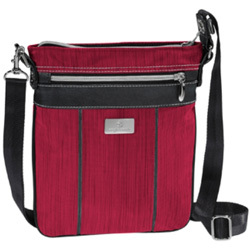 Eagle Creek offers wide range of innovative Day Bags. They not only look good, they offer everything you need in a daypack, i.e. organization, comfort, laptop and tablet compatibility, security, checkpoint-friendliness, etc. Eagle Creek expects their customers to be curious and adventures when travelling. Still, they are so confident in the quality of their products that they offer Lifetime Warranty on all Eagle Creek products. They even offer No Matter What Warranty on some of their products, i.e. no matter what your bag goes through, they will fix it or replace it for free. How can they be so confident in their products? It is because they have return rate of less than one percent. That says quality in any language. Eagle Creek believes their label is your best guarantee and we at B for Bag agree. We own number of Eagle Creek products and have been extremely pleased with all of them. Amazon offers wide range ofn Eagle Creek luggage and accessories. Their prices are among the best you find online with the added security of buying from the number one online retailer for customer support.